We carry a wider range of Spa, Hottub, Pool, Irrigation, & Fountain unions than anyone on the net. 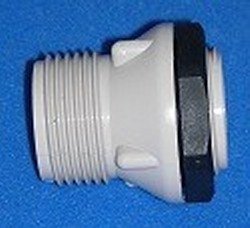 We carry a wider range of Spa, Hottub, Pool, Irrigation, & Fountain Pump unions than anyone on the net. So if you are doing your own spa or pool repairs and updates, this is the place to be. It can become confusing, so take your time to review every page we have listed below. Pump Unions are identified by the size of the pipe it accepts. Imported WHITE & GRAY unions - These economy unions come in gray or white, slip or FPT. Sizes from 1/2" to 4". These unrated unions in both white and gray color and slip x slip and thread x thread configuration. They fit sch 40 and 80 pipe, but are unrated and un-certified. Cannot be used on any project that requires NSF or IAPMO certified products. VERY LOW PRICE. Quality very good for imported (Chinese) parts. Imported. Sch. 80 White Unions - These are all potable water rated, sch 80 unions, but white in color. 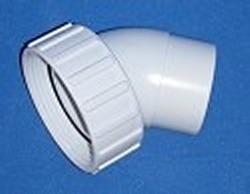 NSF and IAPMO rated fittings are very high quality. NSF Rated for potable water. Sizes available are 1/2", 3/4", 1", 1.25", 1.5", 2", 2.5" to 3". (Special order on some sizes, if you click on this link and don't see the size you need, email us for details) Imported. Sch 80 Unions GRAY. 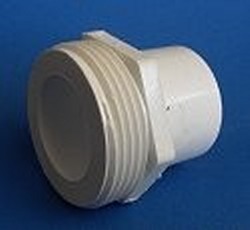 These are NSF and IAPMO rated fittings and very high quality. NSF Rated for potable water. GRAY in color. Made In The USA. Specialty, obsolete, one-off, discontinued, & other Odd Unions . These are mostly used for swimming pools, spas, irrigation, fish, etc. Good quality unions, but some are not rated and their pressure ratings will be lower than the sch 40, sch 80 unions. Some have NSF ratings, some don't. Most Made In The USA. 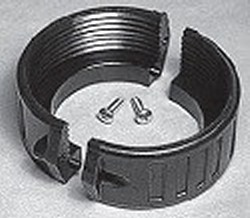 Quick Disconnect (QD) 150PSI Modular O-Ringed Bulkhead Fittings & Support Parts. 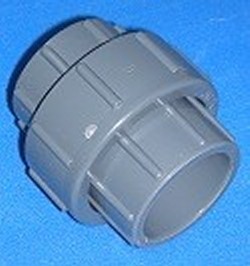 For 1/2", 3/4" and 1" hose or tubing. High end parts. 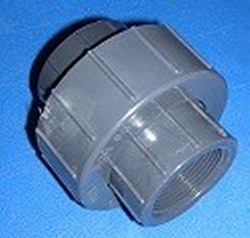 Easy connect and disconnect unionized fittings. Made In The USA. Union Parts. This is mostly tail pieces, end pieces, split nuts, o-rings, gaskets, washers, etc. It's all for unrated unions, all the rated unions are not available by pieces. Some Made In The USA, some imported. Spa, Hottub, & Swimming Pool Pump Unions. These are unrated pump unions. 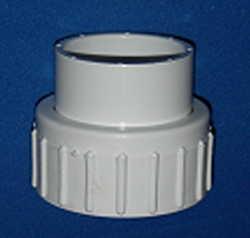 Mostly for swimming pool, spa, irrigation and other pumps. Some Made In The USA, some imported. 45 degree unions. Hard to find 45 degree unions. Some Made In The USA, some imported. Spa & Pool Heater Unions. 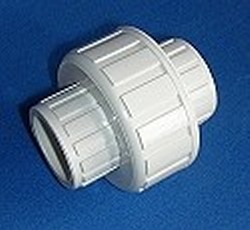 These are the unions for spa and swimming pool heater. Some Made In The USA, some imported.